All reasonably clean and dry corrugated (rippled) cardboard except waxed or plastic coated. NO paperboard. Dispose of on the upper drive-thru floor in the cardboard bunker. 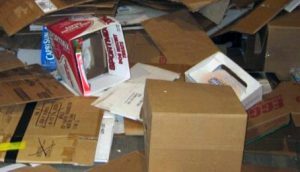 Conditions – Please break down (flatten) the boxes and remove any paper debris and Styrofoam. Food waste, hygiene products and diapers belong in the trash NOT left in your cardboard or mixed paper. *Please note-the new product “Kitty Poo Club” is not a recyclable product, PLEASE DISPOSE OF THOSE IN THE TRASH. R pizza boxes recyclable? Yes and no, clean of leftover food particles and not soaked with grease ARE recyclable. Dirty pizza boxes are bad for recycling because paper doesn’t get heated during its recycling process, grease and oil combine with the pulp, which can ruin the batch. Bales of cardboard and paper waiting to be shipped to the mill or waiting to be processed once at the mill, can sit in storage for weeks, where food particles and grease turn rancid and attract insects or animals. Once the paper or cardboard is cleaned with soapy water and sometimes chemicals to remove inks and glue, it is mixed with clean water to create ‘slurry”. Once in the slurry, the remaining oil floats to the top. It becomes impossible to separate the oil from the paper fibers at this point. When in doubt, cut off the clean tops of your pizza boxes, if it’s a paperboard box, recycle the tops in the mixed paper. If it is a “rippled” or corrugated box, recycle the clean tops in the cardboard. Always discard all soiled bottoms in the trash. The recycled material is used to make box board (cereal boxes), toilet paper, paper towels, etc.